Moved and inspired when they heard of a great need in a country on the other side of the globe, Grisham Middle International Baccalaureate (IB) Programme students collected over 600 books for children of Uganda, donating the precious resource to Libraries of Love, an organization that partners with individuals in Africa to create libraries in schools and close the education gap. The project came to life after Trudy Marshall, Libraries of Love founder and former Laurel Mountain Elementary School librarian, gave a campus presentation about the daily life of students in Uganda. From pictures of their homes and means of transportation to stories about their love of learning, students were quickly inspired to take action. As the project got off the ground, Grisham IB students learned more about the action service component of the IB Programme, which incorporates service projects into curriculum, and the four different types of service: direct, indirect, research and advocacy. They were able to find and select the area of service that best fit their skills through a school-wide exploration into East Africa’s education system. Students began to assess and generate questions related to education and topics they wanted to learn more about, which was followed by time allocated to conduct research and participate in class discussions. Many students chose to make posters to promote the project, while others shared information on social media and at local bookstores. 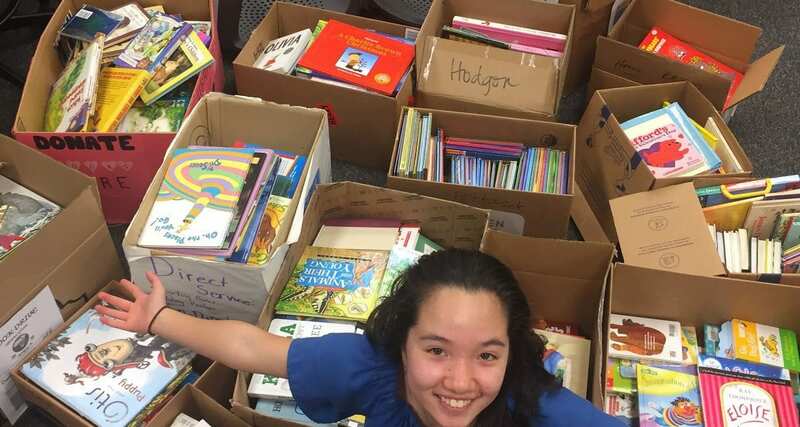 Once the donation drive was completed, students collected, sorted and carried hundreds of pounds of books. Students will also have an opportunity to Skype with students in East Africa this spring and will be able to ask them questions and continue their exploration of the topic. Since its inception in 2005, Libraries of Love has opened 36 libraries in Uganda. If you are interested in learning more about the project or would like to donate, find more information on the Libraries of Love website.